The cancer awareness calendar was developed to help doctors, patients and the general public gain a better understanding of the different cancers that have affected so many peoples’ lives. The goal is to not only bring awareness to different symptoms and the proper healthcare treatments of various cancers, but also to provide information on preventative measures to help individuals avoid risk factors for specific cancers. The month of March is National Colon Cancer Awareness Month, and it is also National Nutrition Month, which makes sense given the relationship between food and cancer development. As we learn more about how cancer manifests in the first place, we are beginning to learn that a cancer diagnosis can’t just be attributed to genes. The World Cancer Research Fund estimates that at least 20% of all cancer cases are related to poor nutrition decisions and lack of exercise. We’ve all heard the Hippocrates quote, “Let food by thyne medicine.” If processed foods, excess alcohol, and red meat could increase the risk factors of certain cancers, could the inverse be true too? Here are a few foods that have shown to decrease or manage tumor growth. Coffee: Colon cancer survivors who drank four or more cups of coffee were 42% less likely to see their cancer return. In a similar study, breast cancer survivors who drank 2-5 cups of coffee saw recurrence drop by half. Foods with Fiber (fruits, vegetables, legumes, and whole grains): Women who ate a high fiber diet early in adulthood lowered their risk of breast cancer by as much as 19%. White Vegetables: According to one study, a diet heavy in cauliflower, potatoes, garlic, celery and other vegetables reduced the risk of stomach cancer by a third. Broccoli: Broccoli contains a heavy amount of phytochemicals, especially glucosinolates, which can be protective against mouth, esophagus, and stomach cancer. Other cruciferous vegetables that have similar protective qualities include cabbage, kale, and cauliflower. Tomatoes: Tomatoes contain lycopene, which has stopped breast, lung, prostate, and endometrial cancer cells from forming in lab tests. Also, be sure to load up on the tomato sauce for dinner. Cooked and processed tomatoes contain more lycopene than raw tomatoes. 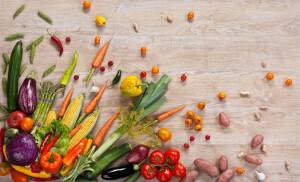 Nutrition is one of the key principles for cancer treatment at the Hope4Cancer® Institute because food plays a powerful part in cancer prevention and care. Some of the components of the nutrition program at the cancer clinic in Baja California and Cancun, Mexico include a vegetarian diet, alkalized water, personalized meal plans based off the cancer and its stage, organic juicing, and more. Given the high costs of cancer care and horrible side effects that come from conventional medicine, food might be our best defense against cancers of all kinds.